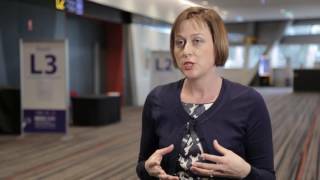 Rachel Gibson, PhD of University of South Australia, Adelaide, Australia, discusses the role of gut microbiome in causing diarrhea in chemotherapy-treated patients. Dr. Gibson mentions recruiting a number of patients who had been hospitalized due to their chemotherapy-induced diarrhea, taking a stool sample for the investigation. Analyzing these results, Dr. Gibson mentions that results showed a clear differentiation between the commensal and pathogenic bacteria, as patients displayed huge numbers of pathogenic bacteria. This suggests chemotherapy was altering the gut microbiome. She then highlights how this will allow for targeting of specific treatments and investigations to look into the gut microbiome. Dr. Gibson further analyses these findings stating how the chemotherapy wipes out the commensal bacteria, allowing pathogenic bacteria to enter and colonize the gut, causing some of the symptoms. Studies are currently investigating the role of Toll-like receptor 4 (TLR4) in pathogenic bacteria proliferation. A TLR4 inhibitor drug could potentially stop those pathogenic bacteria binding and hopefully reduce toxicities. The data for TLR4 appears to be strong on a number of fronts in cell culture, preclinical animal models, and in early clinical studies. TLR4 is already being used in a clinic in a range of other studies, therefore when researchers target TLR4 it already displays some safety efficacy studies and therefore does not require to be tested for safety in patients. Dr Gibson mentions naloxone, approved for pain relief, which should offer a rapid translation into the clinics if promising results are present in the early studies. 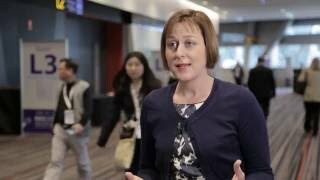 Recorded at the Multinational Association of Supportive Care in Cancer (MASCC) 2016 Annual Congress in Adelaide, Australia.